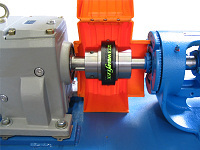 Rexnord elastomeric WRAPflex® Coupling has made it that simple! Its unique patent-pending design makes it easy, cost-effective and simple to use in your plant. Standard couplings include two steel hubs, one polyurethane element & one nylon cover with screws. Rexnord/Falk 10R-10 Build-A-Coupling, Wrap-Flex, 1,125 Inch lbs. Rexnord/Falk 20R-10 Build-A-Coupling, Wrap-Flex, 2,800 Inch lbs. Max Torque: 2,800 Inch lbs. Rexnord/Falk 30R-10 Build-A-Coupling, Wrap-Flex, 4,600 Inch lbs. Note: Set screws are not included with this item, but are included with the elements. Rexnord/Falk 5R-10 Build-A-Coupling, Wrap-Flex, 550 Inch lbs.